Good to have you back, judges! This week, we’re chatting with one of the most veteran active judges in the program and a member of the Magic Judge Hall of Fame. Like Elvis or Madonna, many know this rock star by just a single name: Carter! 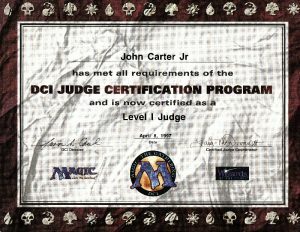 Judge start date: April 8, 1997, according to my “suitable for framing” Judge certificate. Why did you become a Judge? When I started, rules where done store-by-store with their own banned and restricted lists. I wanted to have a consistent experience no matter where I went in town. That, and the groupies. Best tournament result: Played in the last Pro Tour on “The Boat.” That event made me the judge I am. Random fact about yourself: I celebrate the holidays every year with ribs flown in from Memphis, TN. That is a good reminder that players are people, and recognizing each other’s humanity is part of being an exceptional judge. 2) “If someone says you’re being a jerk, the first thing you should ask yourself is, ‘Am I being a jerk?’” When we hear negative things, the impulse is to immediately justify or explain. Sometimes we just do or get things wrong. Respect the people in your events or your life that are willing to tell you what you get wrong—that’s the first step in getting better. A girl named Stormy taught me to play at a diner in the middle of the night, and my best friend in college got hooked, too. He read stuff to be more competitive, and I read to understand the rules better. I’m sorry, I don’t understand the question. What is a non-Magic life? 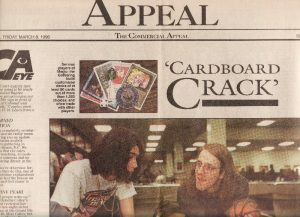 I have been incredibly fortunate to be able to make Magic and gaming a central part of my life and do many awesome things. I have sacrificed a lot and endured a lot, but me, my life, Magic, and being a judge are basically indistinguishable at this point. I am a judge. It’s not what I do—it’s what I am. And the fact is that most of the very best people in my life are judges. Judges in the aggregate are some of the best people one can find almost anywhere. The genuine care we have for each other and willingness to work together for the benefit of individual members as needed. Gaming of some sort—always something gaming, though the specifics vary. Actually, I have a favorite moment pending. Vicente Davis knows what it is. In related news, be careful about handing your phone to Carter. For a stretch of a few months while playing Commander, I kept tapping Maze of Ith for mana. I blame Urborg, Tomb of Yawgmoth. Many favorites each for their own reasons. Either of the Modern Masters GPs in Las Vegas. I can be terribly shy. Judging gives me confidence. It’s also taught me how to analyze, problem-solve, lead, follow, listen, and so on. My everyday life is better every day because judging has made me a better person. Abraham Lincoln. I thoroughly believe in how he brought together rivals and used their struggles to make the answers he came up with all the better for it. He also knows a thing or twenty about making hard choices and helping people commune with the angels of their better nature. I’d likely wind up working in community development or event planning—always trying to connect people to each other and what they love. Does interacting with the environment count? 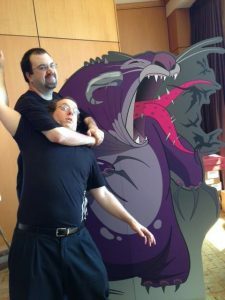 A few years ago, I was playing in a 2HG Prerelease. Our opponents tried to block. I pointed out the card had flying. He lifted his non-flier up and said, “Flying?” I lifted ours up, “Fly…ing.” Higher the opponent went saying, “Flyyyyying?” At this point I flicked our flier straight up saying, “Flying!” (Btw: don’t try this at home.) The weirdness is that the creature never came down. Somehow, the corner had gotten in the tiny ceiling tile gap such that the card and sleeve were dangling from the ceiling… Flying. You do know what the first rule of “after events” stories is, right? Well, I’m me, so I pretty much hang out with myself. A lot of what motivates me now is seeing events go smoothly, judges get better, and players have fun. So when I’m not executing on a specific task, I look for ways to make any of those three things happen. Seeing a judge to better on calls late in the weekend after getting to talk to them early in the weekend about taking calls is fun to me. [+ 6] Draw a card. Yep, it’s that simple. “Draw a card” is my favorite mechanic—it introduces a world of opportunity. +6 means my ultimate is actually making me stronger, not weaker. And what kind of ultimate adds loyalty instead of removing it? The kind that puts a huge value on loyalty and that’s willing to turn old ideas on their heads. Sage of Lat-Nam (for which I own the 8th Edition original art) is a Human Artificer, but he used to be a Sage. For actual event effectiveness? 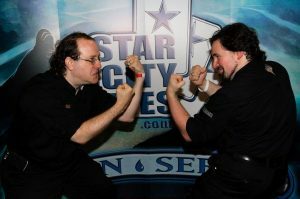 Seeing the beginning of the main event at GP Las Vegas 2013, despite all the doubters and setbacks. I had designed a floor plan with many features that were new and maximized every square foot of the available space. 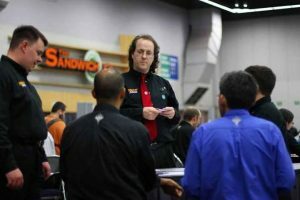 The event almost doubled the previous Magic event size record (a day after the Vegas Mini-Masters had broken the Magic record), and it set a new World Record for trading card events (previously held by a non-Magic event). From a more pure-judging perspective? 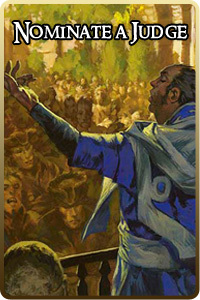 Being elected on the first ever ballot for the Magic Judge Hall of Fame. I’ve always worked to make the Judge Program more accessible, friendlier, and more effective for judges, players, and organizers. To have my peers recognize my contributions to a program we all love is both touching and humbling. In all I’ve done, though, the thing that makes me most proud is seeing the successes of the people who I have helped, defended, supported, or given opportunities as they grow and develop. Urza—he has been around a very long time, he wears glasses, he likes to tinker with stuff, he has a temper, he’s imperfect but keeps trying, he’s a father, and he doesn’t get along with his brother. Oh, and he’s pretty baller. Except for judge shirts, I have only worn red shirts for the past ten years. I once removed a catheter from inside my own kidney while on break at a tournament. I once broke my ankle at a large tournament, wrapped a bandage around it, and kept working anyway—for two days. 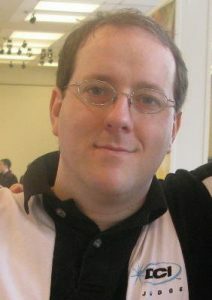 David Rappaport does not hold a black belt in Tae Kwon Do. He has formally trained in Tae Kwon Do and privately studied Chin Na Kung fu, but never passed the rank of red belt. Old Dave doesn’t jump. Carter is the judge who first made me realize how great a challenge, but how great a community, the judge program would be.